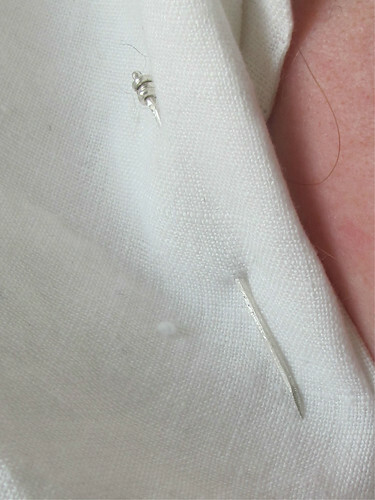 Dress pins are a must have for the person wearing veils and wimples and so. But they are surprisingly expensive for what they are. I do understand why but still, I am a student and sometimes it is hard on the wallet to pay around four to five Euro for one single dress pin. 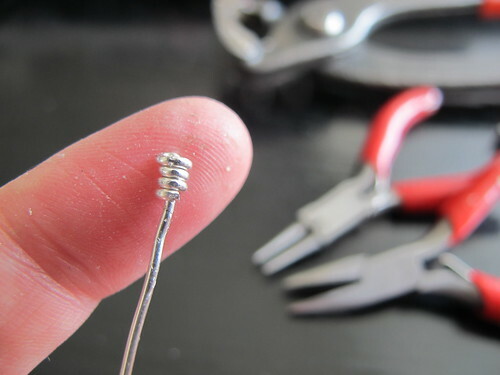 A metal working friend of mine said “well do them yourself, they are really not that hard to make”. 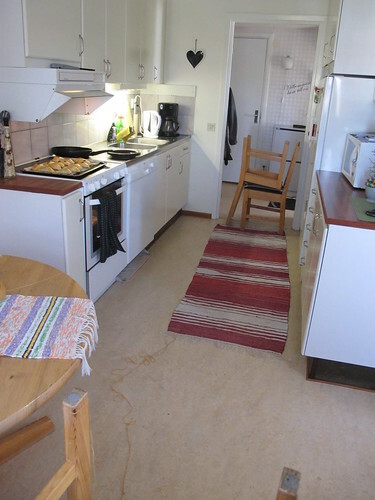 But I did not really believe her, nothing is hard when you already have the skills of the material. 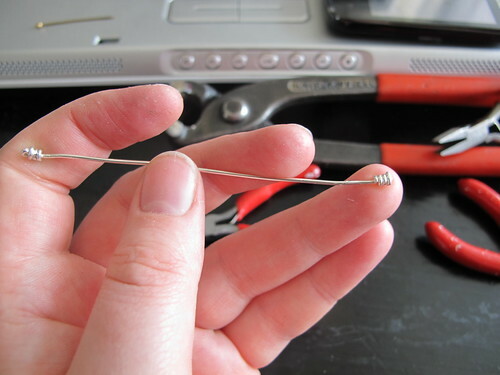 But when cleaning my worktable I found a piece of silver wire I bought a few year ago to wire wrap some jewellery and I thought that I can try it anyway. You can not really do anything worse then failing and if you do you don not have to tell anyone that you even tried. But really, they ARE NOT that hard to make. 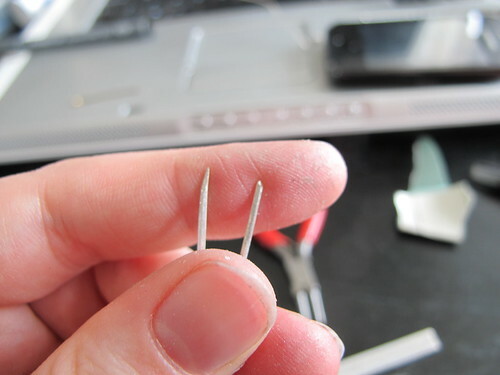 It took me around 20 minutes to complete my first two needles, they are not all that pretty, but they are not ugly and works perfectly. And they cost me virtually nothing at all and are in fancy real silver. 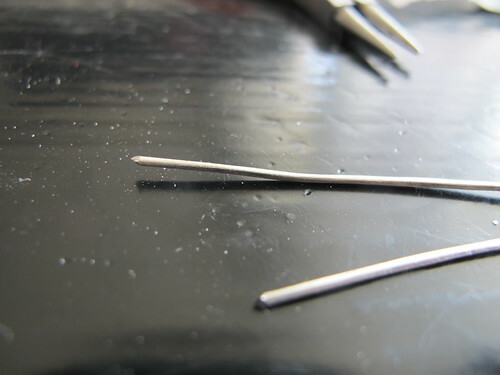 A popular type of pin heads are the wire wrap and there are a lot of extant medieval pins found with this type of heads. 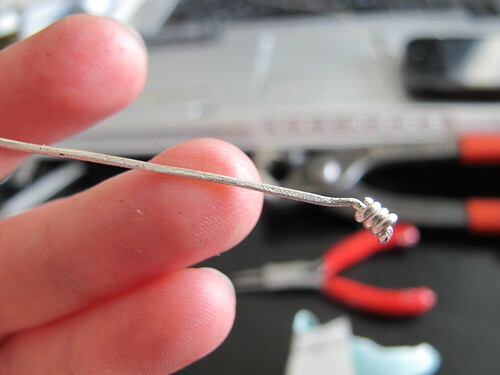 I started with a piece of wire, it is quite soft at the moment but don’t worry, we will harden it later. 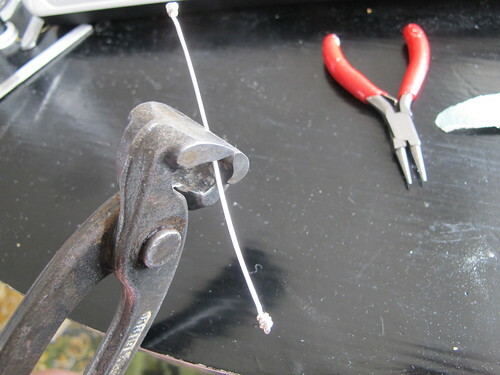 Using a round nose pliers I started to make the wire wrap. 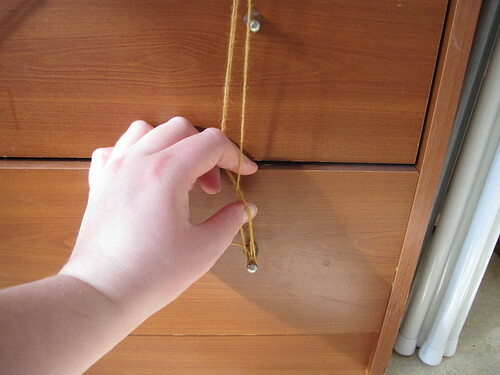 Keep twisting the loose tail around. Here are my tools, the small pilers are a bit to small to be easy to use, but I got them ages ago and they were dirt cheap. 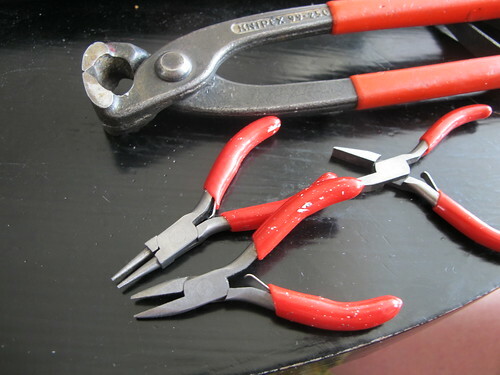 The big one is just a ordinary wire cutter. Work your heads and try to make them look even and nice. 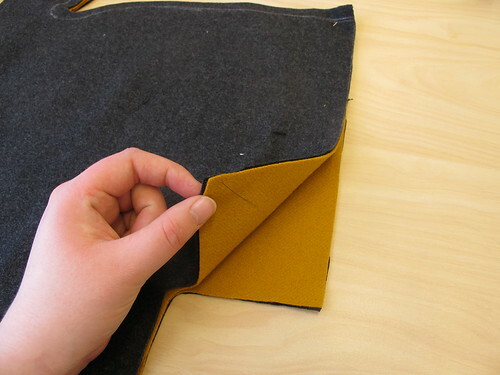 When you have finished the wrap, cut the remaining tail of. 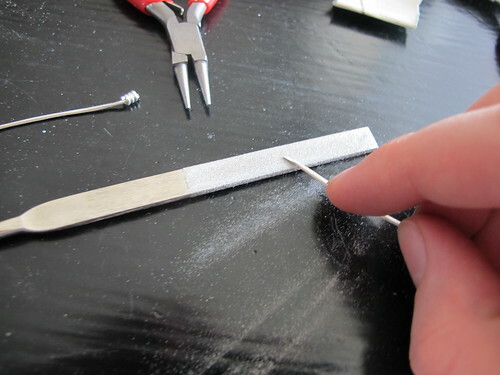 I make two pins at the same time, to save time. 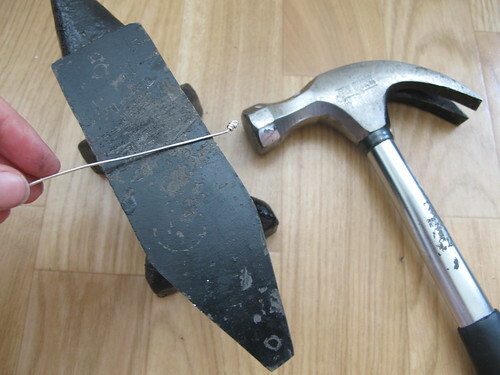 On my tiny anvil I hammer the thread with a hammer. 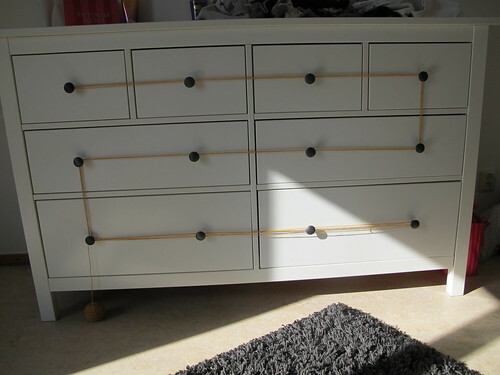 Any hard surface will work, but there can be marks on it after so use nothing to fancy. The hammer is just an ordinary builders hammer nothing fancy at all. 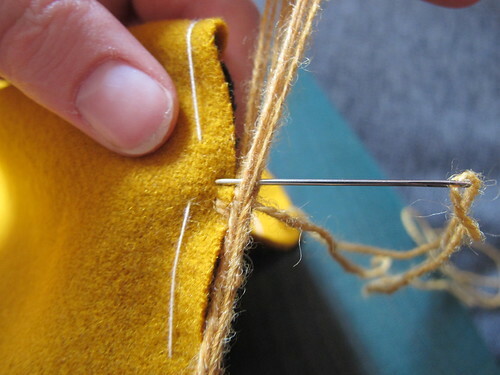 We hammer the thread to make it harder, as it first was to soft to be able to use as pins. 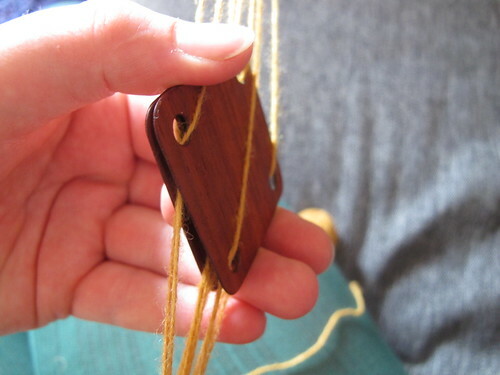 I try to hammer the thread all around, it will become a bit flat but we will sand it later so no worries. 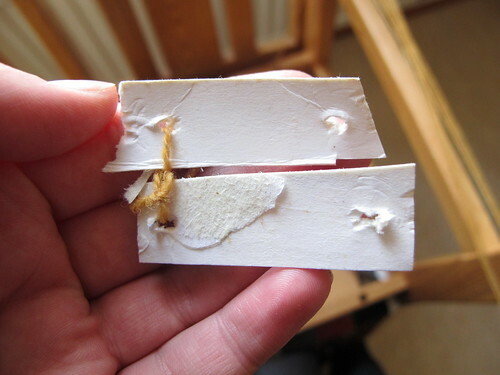 Sand it down with a piece of fine sand paper. 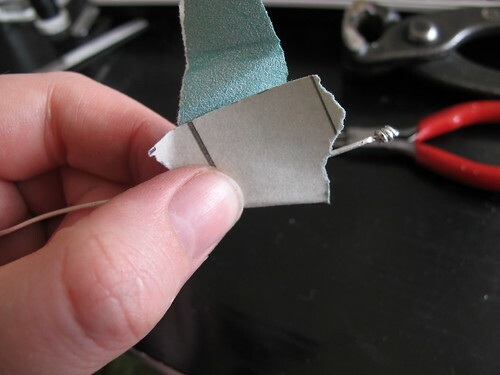 Then cut the pin in two, try to cut at an angle. This will save you time later. When just cut the end are a bit to blunt to be used as they are. 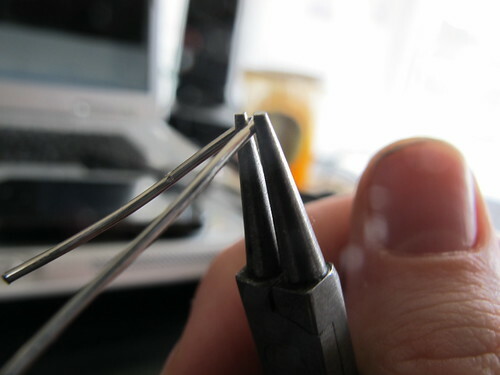 I use a file to file the ends to sharp points. 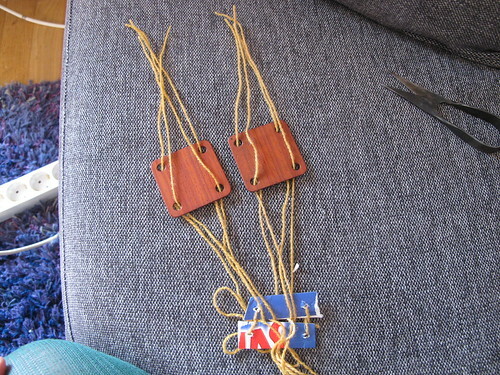 And that was that, they are now ready to be used as dress pins. 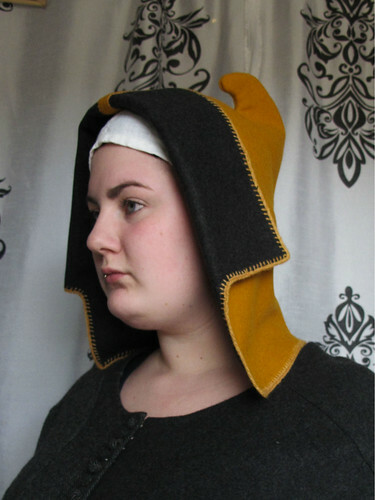 Last year I wanted to make a open hood with the silly hook on to top, but when I did a toille it looked really off and I decided to make a buttoned hood with liripipe in stead. But at last summers medieval week I saw Saras red open hood I was really inspired and decided to make one for this summer. There is so many different variety of open hood in the pictures, I have based mine of several picture and these are some of them. 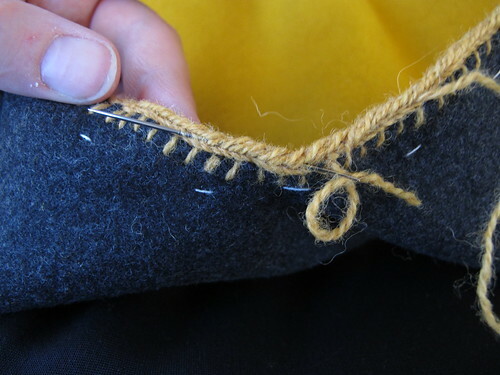 Using my liripipe pattern as a guide I made a toille for a open hood and it did not take long before a pattern was made. 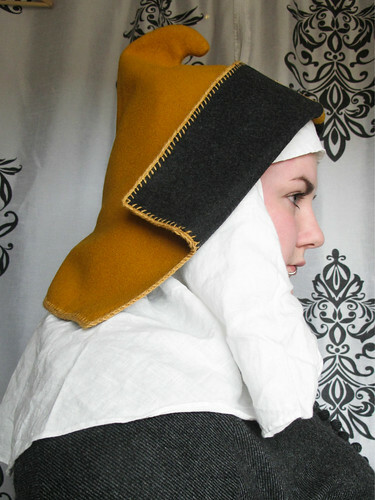 This kind of hood does not require a lot of fabric so it is a great way to use scraps. 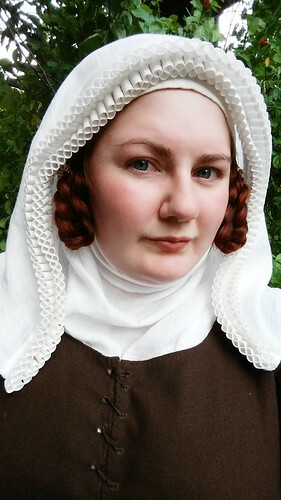 It was also a really fast project, started on a Thursday and completely finished on the Sunday after, with not that many active sewing hours. 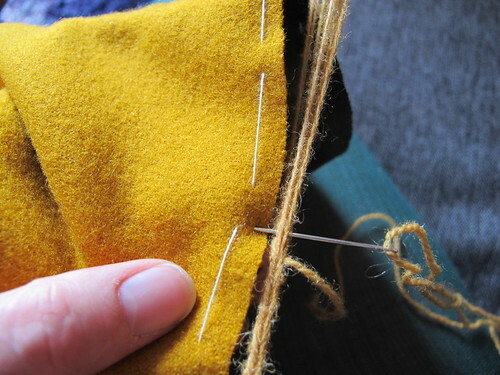 I wanted to make it in wool and lined in wool so I took some scraps from my liripipe for the gray lining and some left overs from my new yellow dress I am making for the shell fabric. 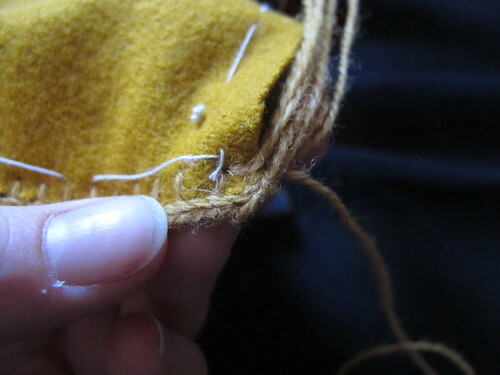 I wanted to tablet weave the edge of this hood and these fabric is slightly fulled so there is minimal fraying of the fabric and that is nice. When cutting the pieces out I put them all together. 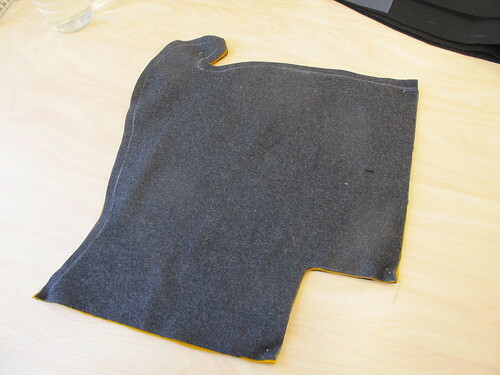 So that the linings right sides are out and the shell fabrics right sides are facing each other. 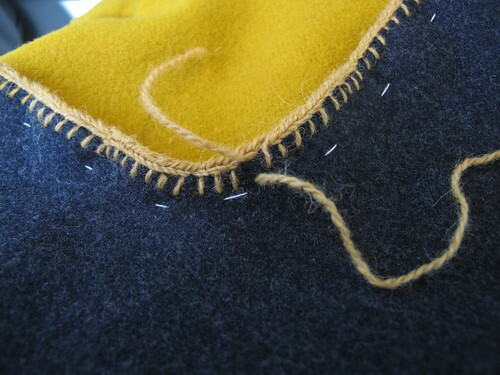 Using a chalk crayon I mark where I want to sew. 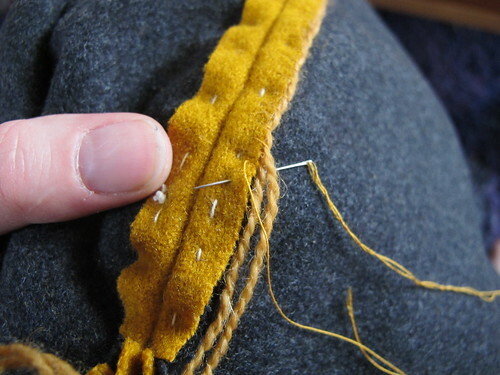 I use a back stitch when sewing all the layers together, all at the same time. 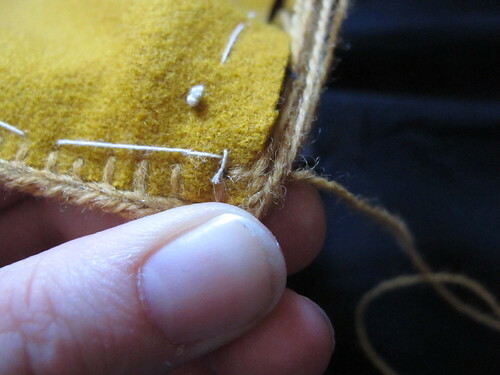 I sew with small stitches using a waxed linen tread. 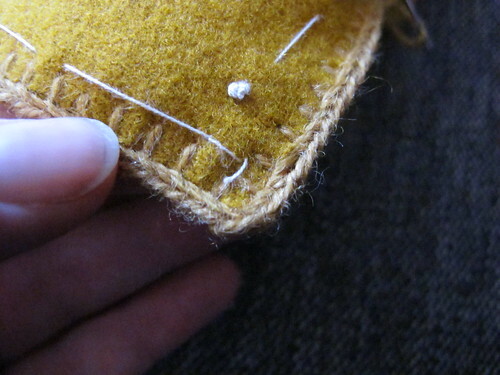 When hand sewing I try to make as small stitches as I use when sewing on the machine. 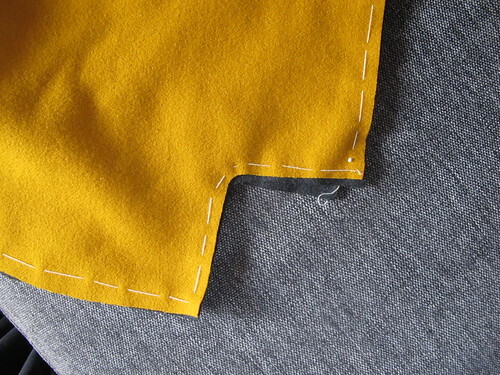 Then I cut some of the seam allowance away on my lining. 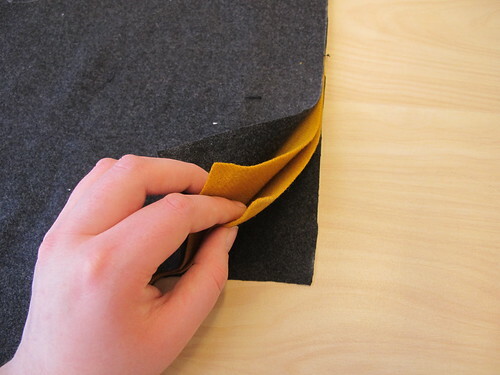 This is so that it will not poke out when we are going to cast down the edges and it also makes the seam allowances smoother since it thins it out a bit. 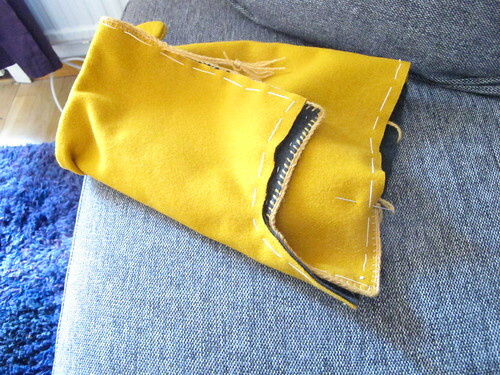 Then I press this seam apart, I was travelling by train when I was sewing this so they are just basted down in my pictures, it works just as fine as long as you press your seams later. 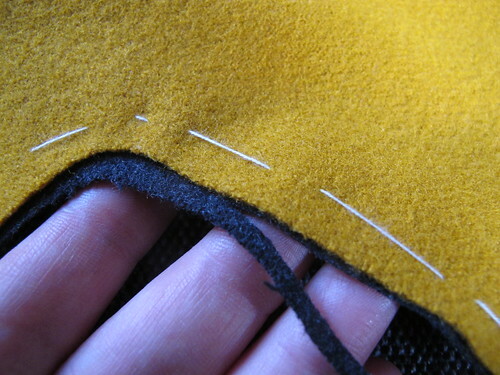 I now sew the seam allowances down, I use filler threads when sewing down the seam allowances. 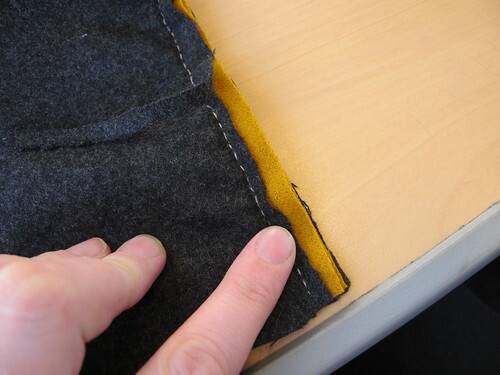 They protects the open edge of the fabric and keeps it from fraying and it also looks really pretty and neat. 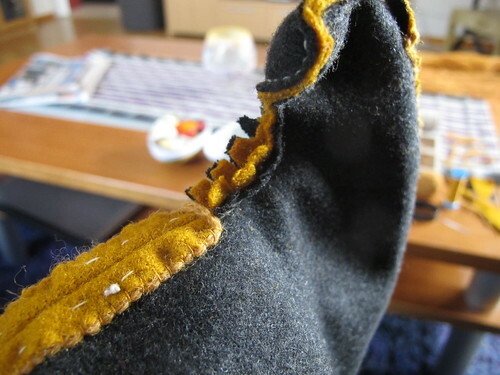 This is a technique found of the garments from Greenland and is described in my favourite book about medieval textiles “Woven into the Earth” by Else Østergård. 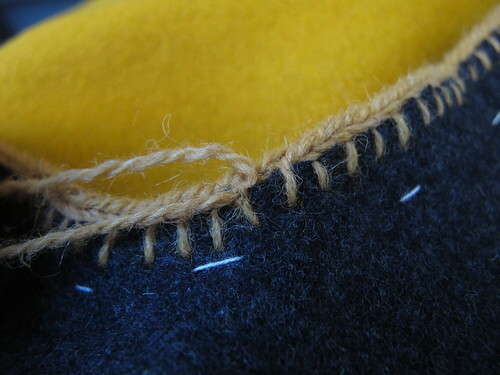 I take care and make sure that the stitches only goes through the lining and not the shell fabric. 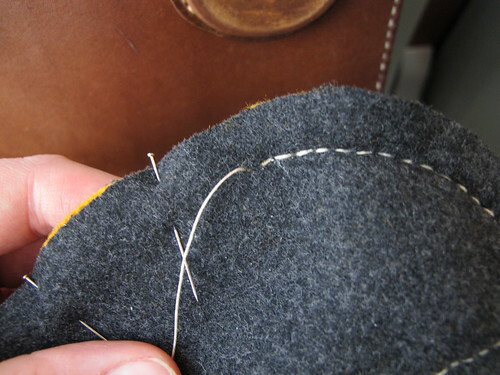 I do not split my seam allowances all the way. 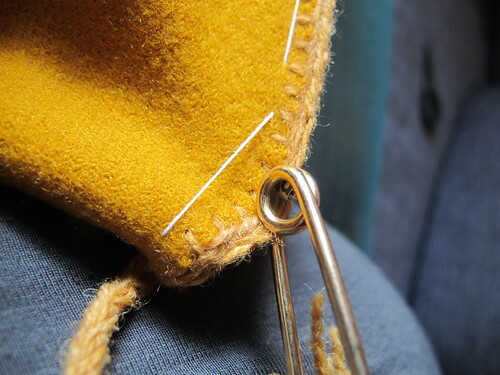 In the hook part I cut the seam allowance down a bit and also cut some notches so the curve does not pull and then I press it apart. 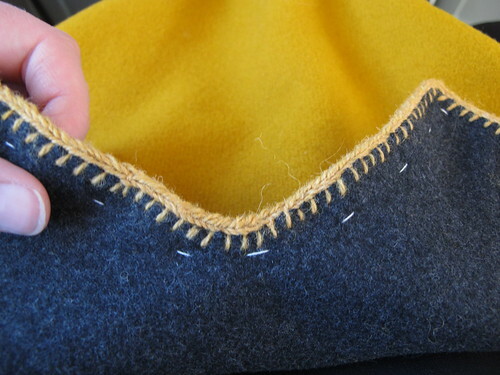 But sewing it down is not necessary, it only adds bulk and it will never be seen anyway. 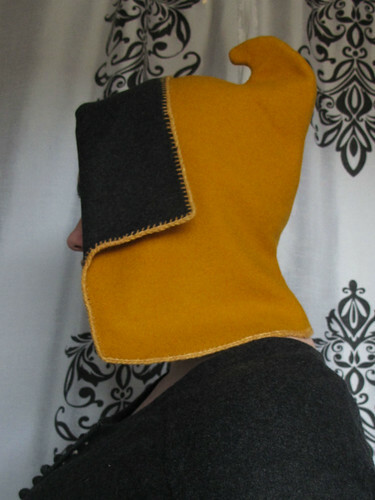 Then I turn my hood right side facing out. 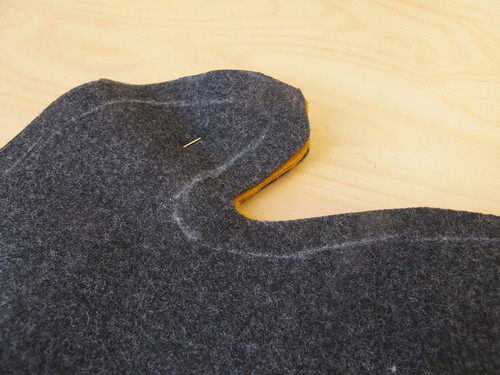 I smooth out the fabric and baste the edges together. 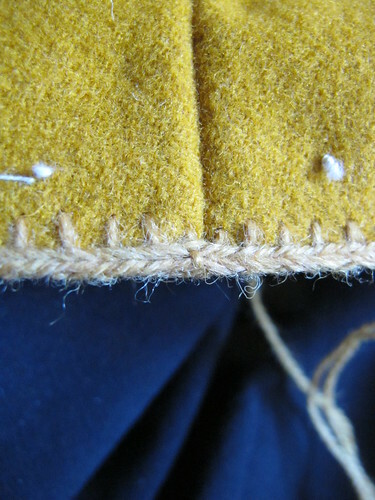 Here you can see that my edges have shifted a bit when sewing the top seam. 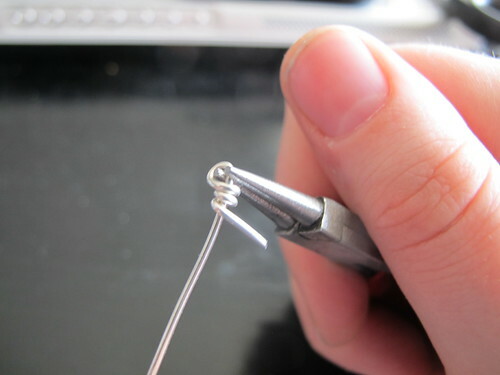 Now you can edge your hood any way you want to, but I wanted to show you how to card weave/ tablet weave the edges. 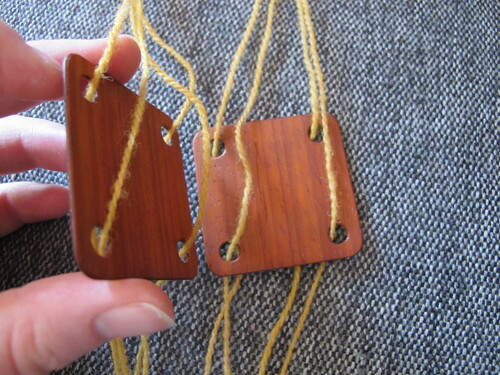 There is no need for fancy materials to do card weaving, I bought my beautiful wooden cards from http://ampstrike.etsy.com but you can use a sturdy cardboard to make your cards. 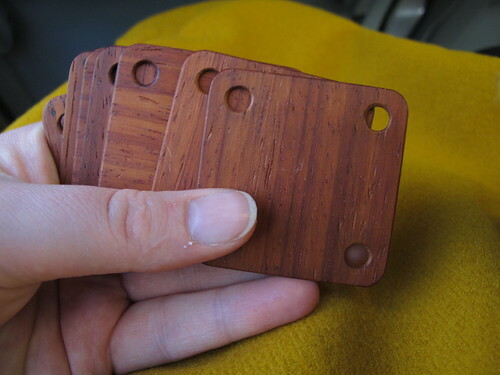 The size and thickness is all personal preferences, I like to use thin smaller cards. 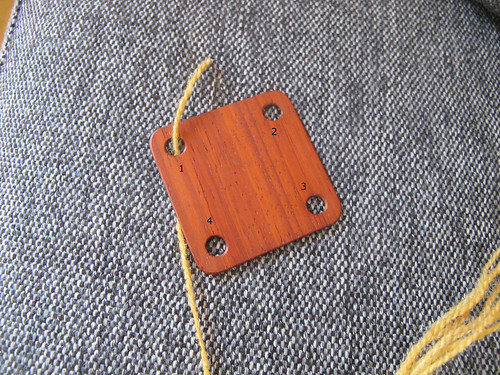 I am going to use two cards for my weave, each card have four holes in it so I will need eight warp threads. 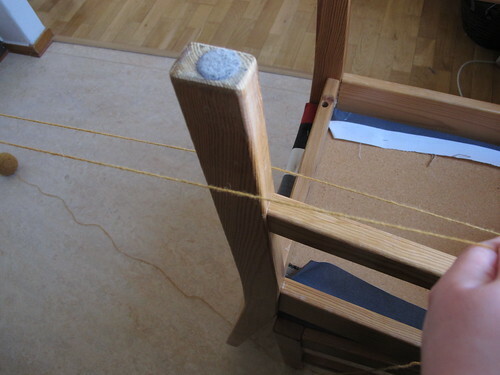 Using my mothers kitchen chairs I warp the threads to get the same length and to get them sorted out. 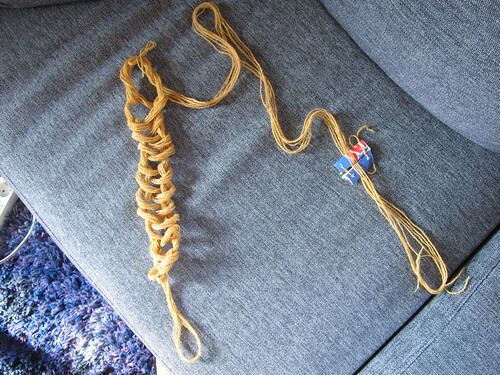 This is more important if you have a complicated weave, but I do it this way anyway. 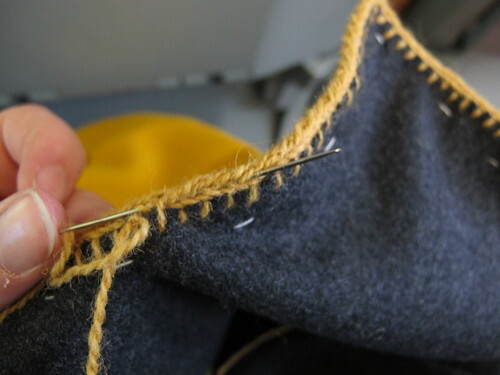 The length of your threads are the length you want to edge and then I always add half a meter more, to be on the really safe side, and then a bit more to not come out short in the end. 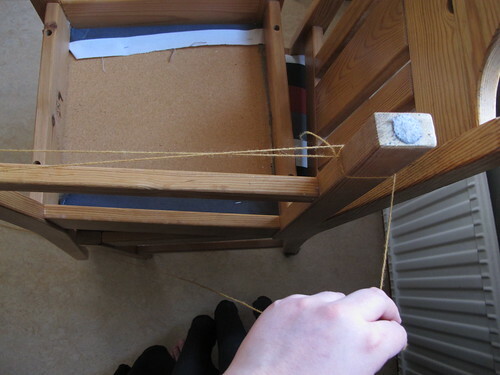 I just tie the thread to the leg of a chair that is turned upside down. 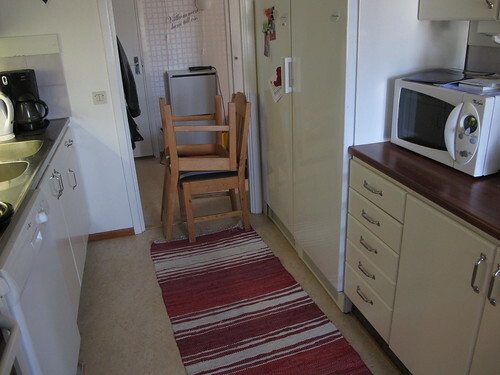 I put the other chairs the distance apart that I need to warp. 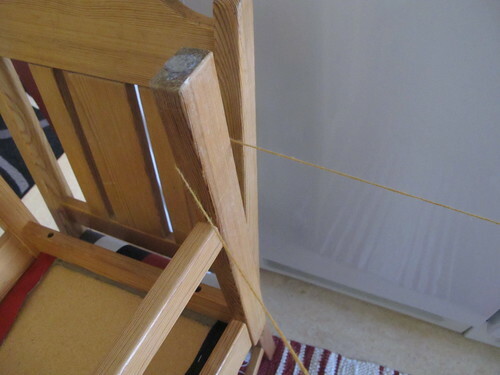 I go around the leg of that chair. When I come back to the first chair I make sure to go on the other side of the leg. 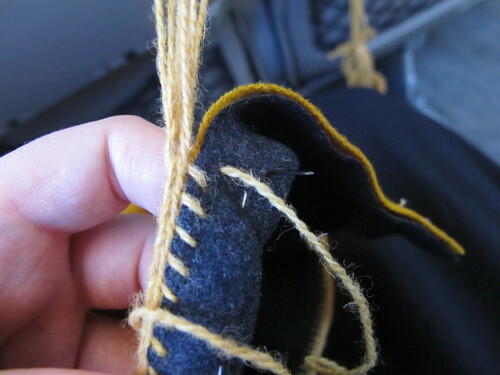 And the around the first leg again So that you create a crossing of the threads. 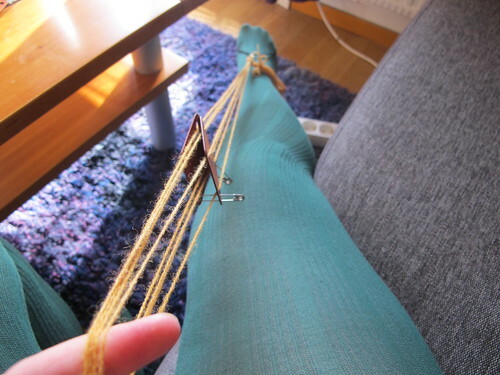 Then I do that until I have the right number of threads. 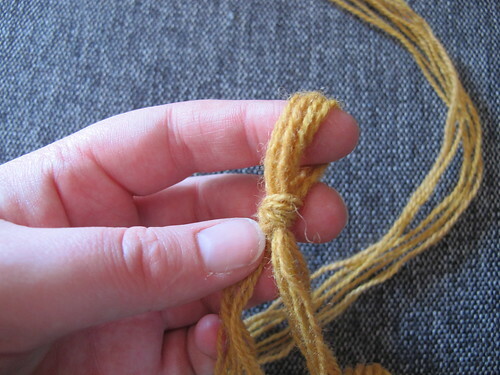 The crossing of the threads is important, it makes sure that you can see in what order you warped the threads. How it look on the other chair. 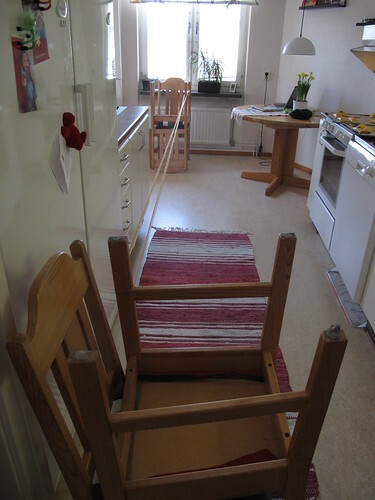 We like long kitchens when warping. 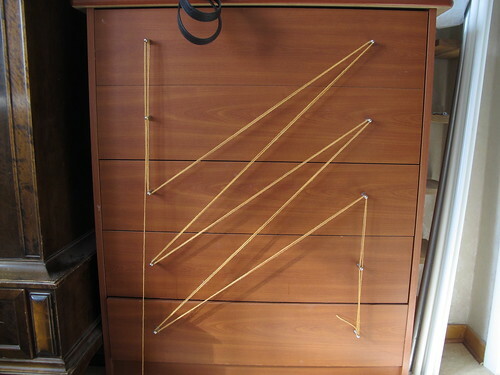 I want to save the crossing of the treads for later, so I make this cardboard divider. 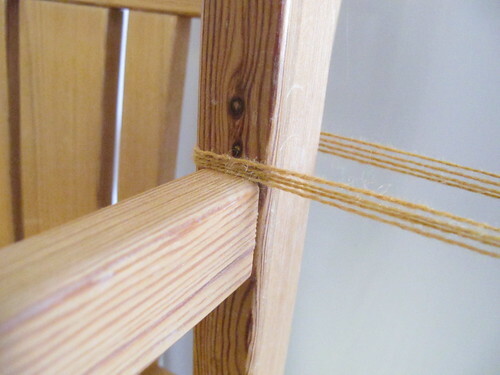 If you are a bit short on space, this is a good way of warping. 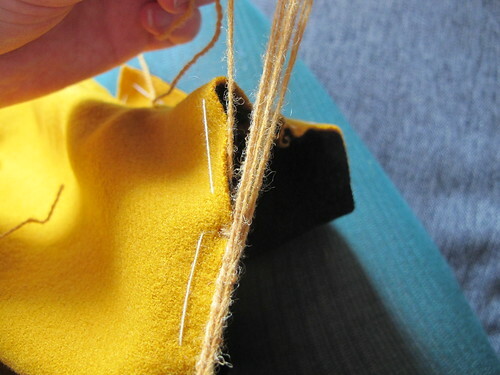 The important this is to get the crossing of the threads. 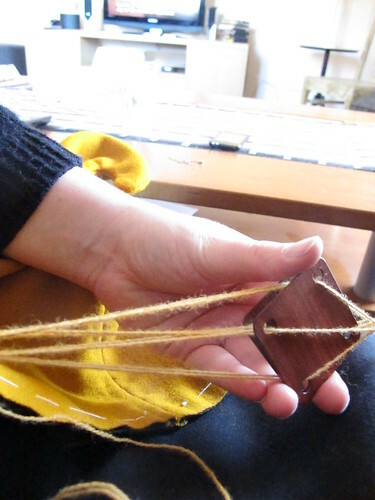 I tie a knot around the warp threads to keep the end together. 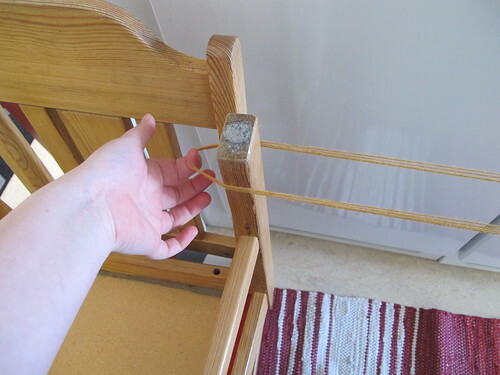 And then I take it of the chair leg. 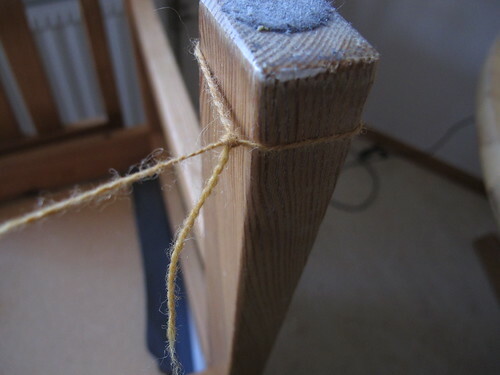 I tie a slip knot in the end. 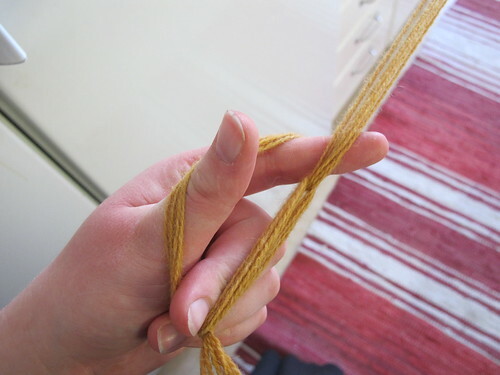 And then hand crochet the warp threads loosely to keep them neatly together. 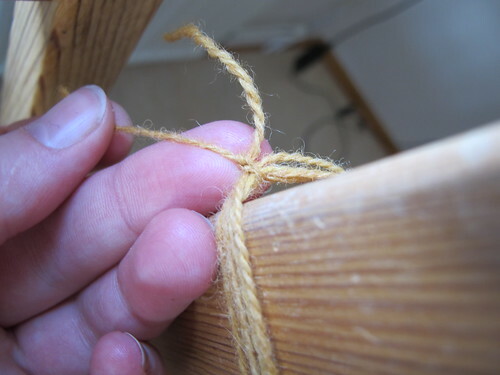 Leave a part to weave with loose and just tie a simple bow around the last loop to keep it from unravelling and then you can take it of the other chair to. 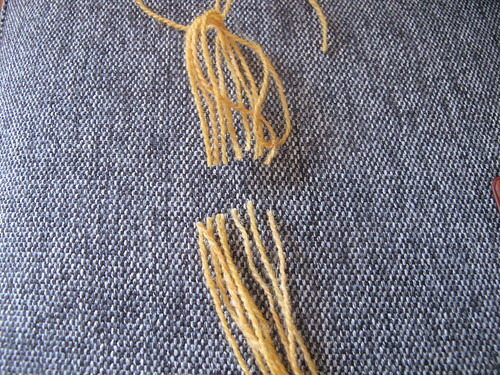 Now cut the end of the loose end above the crossing of threads part. 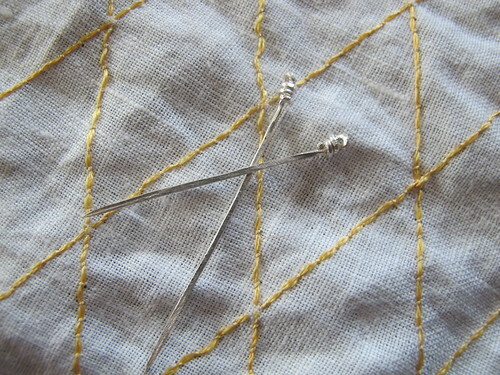 Now it is time to tread the cards, they are threaded in this order and is threaded from the back to the front. 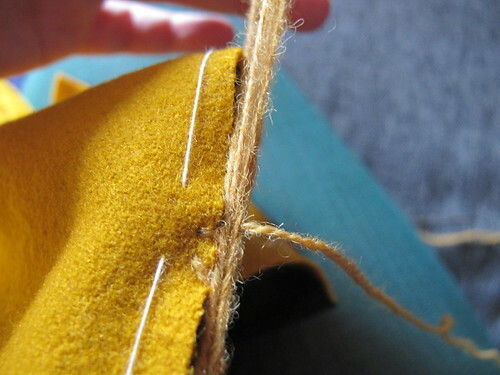 Now you can see the use of saving the crossing of the threads. 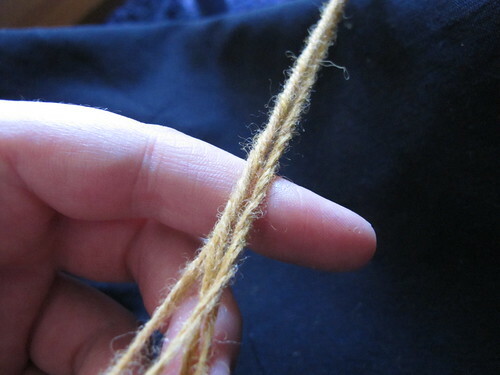 You can easily see which is the next thread to thread. 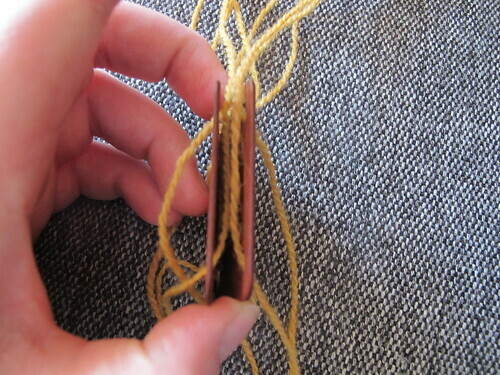 Now I have threaded both my cards. I now want to put them together, I put them back to back or face to face. I was going to have one more card I would put it back to back with the last card. 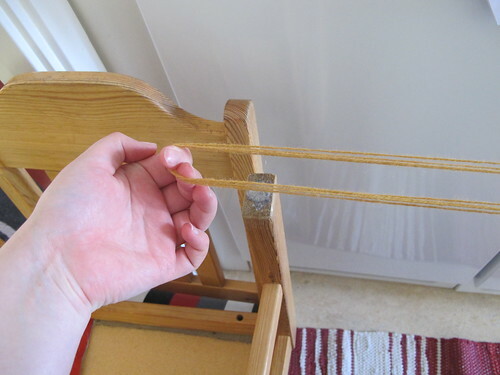 This is to get a well balanced weave. 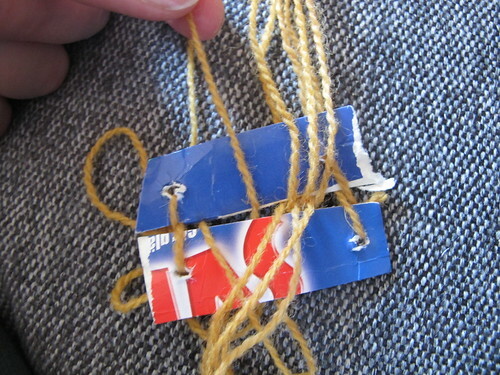 I use two safety pins to keep my cards from turning around and getting tangled. I put these in whenever I am going to do something with my project that might make me loose the order of my cards, just to be sure. 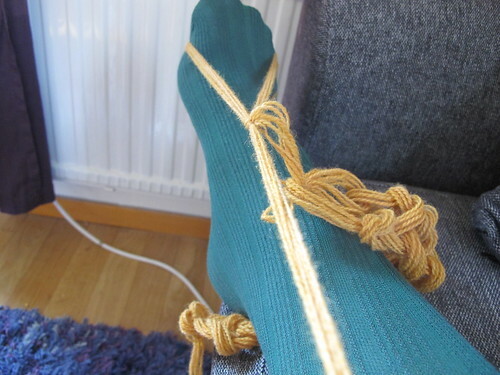 At the far end before your crochet braid I make a slip knot, I will put this on my foot. 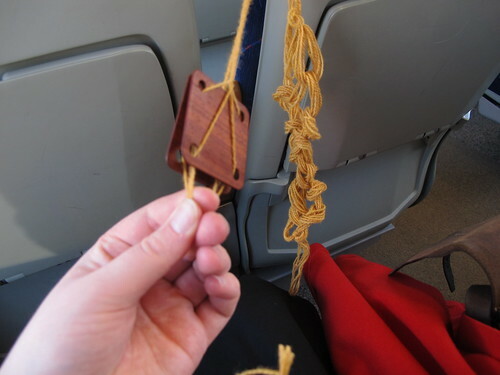 I put it on my foot and make sure that the warp treads are equally long. 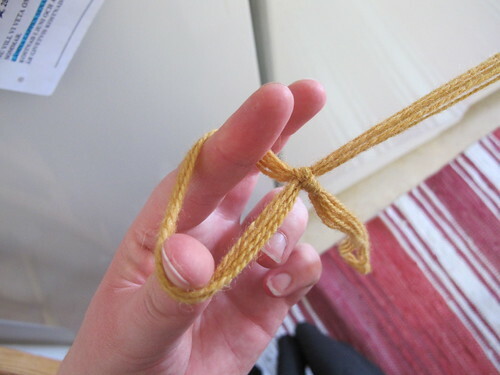 Then I tie a ordinary knot in the front after the cards. 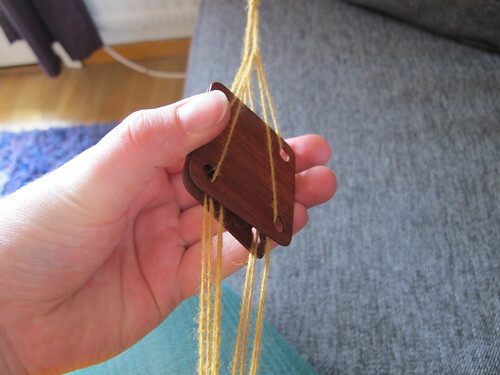 I attach this to a belt in some way, this is just temporary so I just tie it of with a piece of yarn. 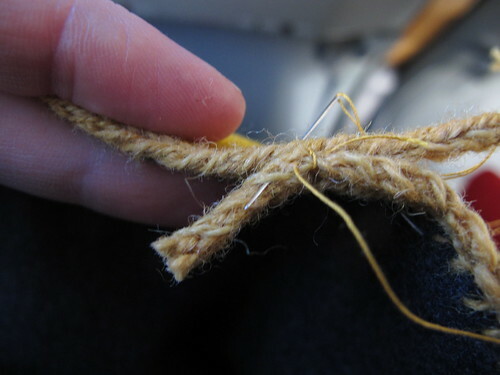 For the beginning you are just going to weave a ordinary ribbon. 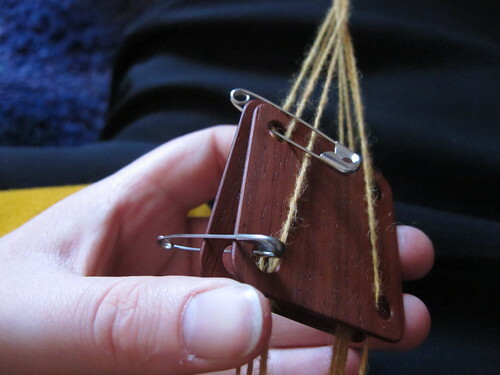 Take out the safety pins, put in a thread, and turn both cards at the same time, it does not matter if you turn them from you or towards you. Turn them one step and as long as you keep tuning them in the same direction. 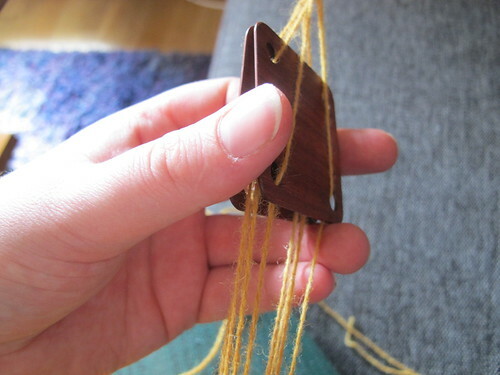 When you turn the cards the threads shift and the thread is secured. You can now put in the tread from the other side, pull it snugly and then turn the cards again, turn the cars in the same direction as the first time. 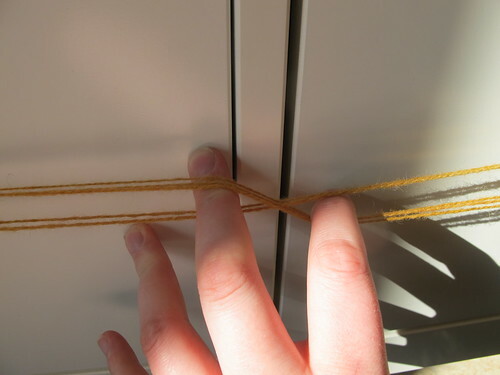 Keep doing this for a while and you will not have a ribbon. Remember to turn the cards in the same direction all the time. 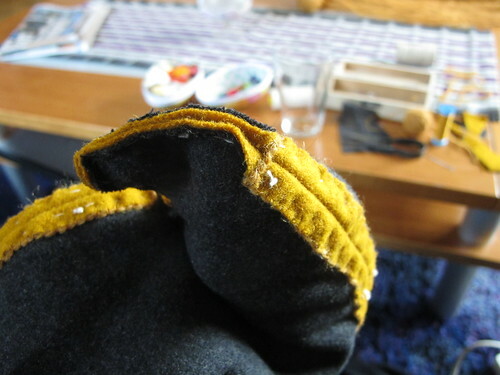 It is now time to start the edging, I start in the back somewhere where it will be less visible. 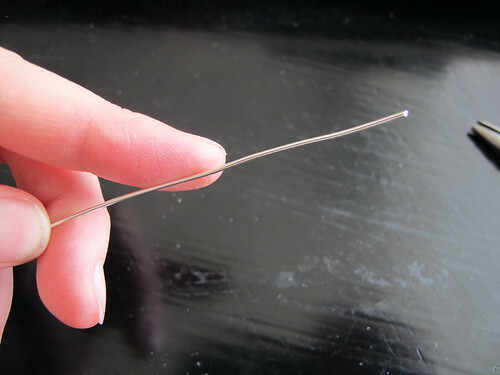 Thread the piece of yarn in a needle. 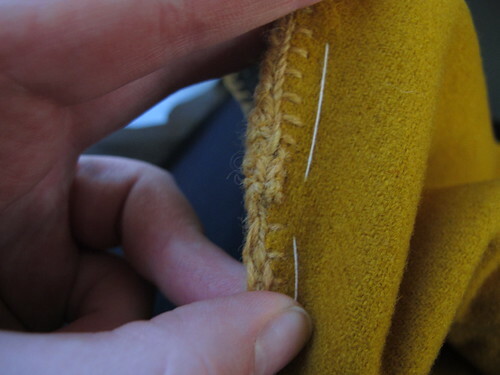 Now, in stead of just putting the thread from one side to another, we are also making a stitch in the fabric. 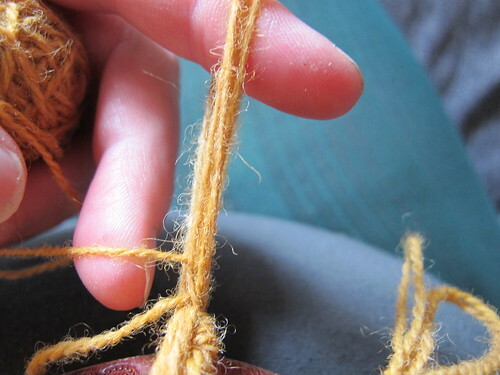 Pull it tight to the braid. 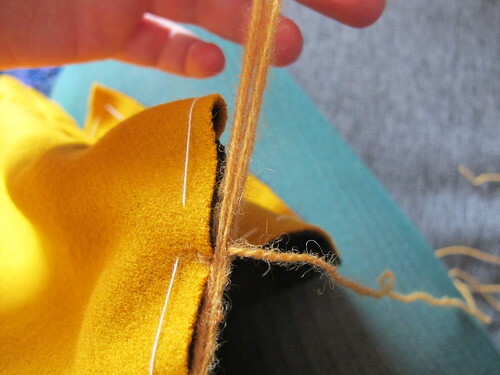 Put the tread through and take a stitch and pull it tight to the braid. 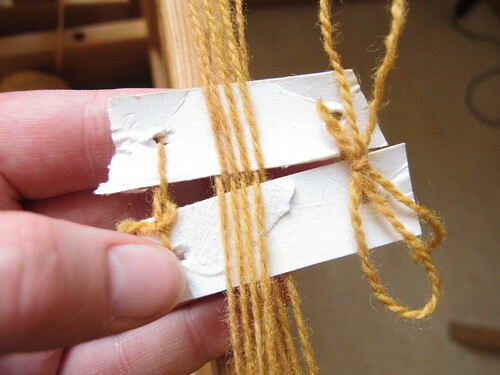 To keep the warp with enough tension you need to keep the warp threads at a good length. 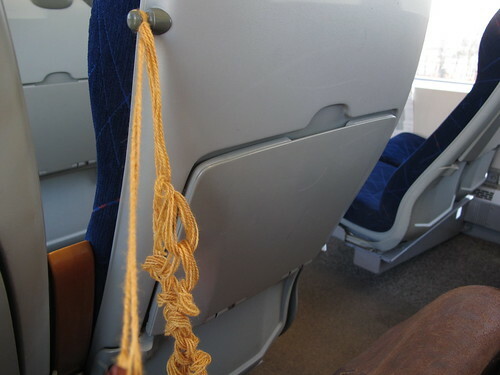 I tie the warp thread to my foot or whatever is available, the knobs to hang your purse on the train, the leg of a table. 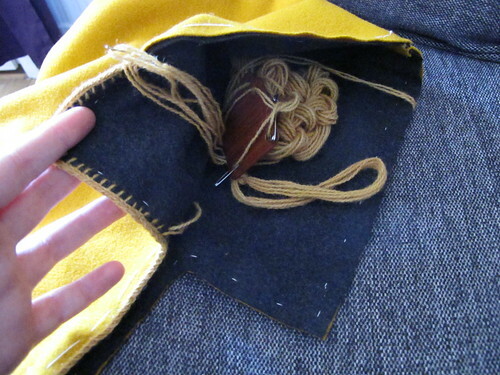 After you woven a while you want to move where your project is attached to your belt. 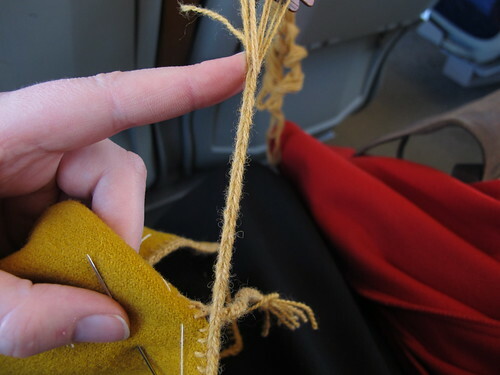 I use a kilt needle and put it in the middle of the braid and then attach it to my belt. 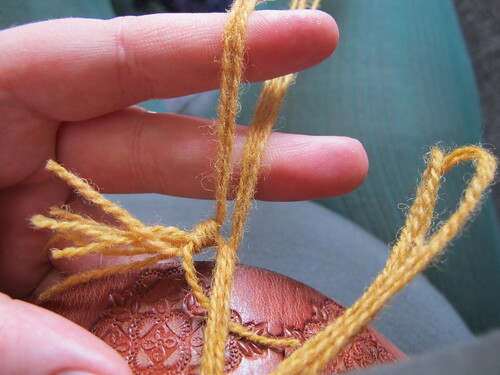 When you come to a corner you want to just weave a bit of braid to get you round the corner. 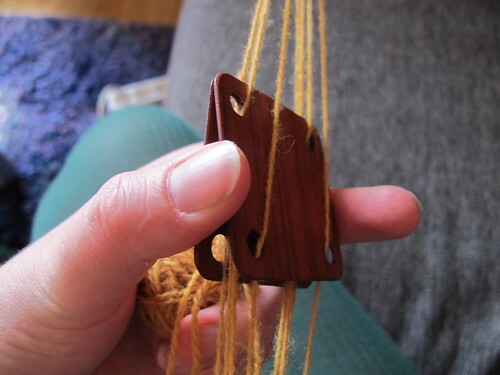 This is how I do then I want to take a break from the weaving without having it get messed up and tangled. This is how it looks from the side when turning the cards once. 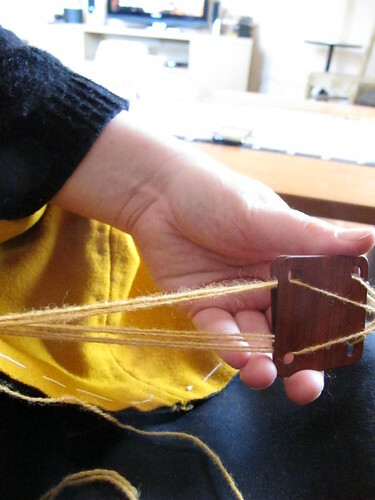 After a while you will notice that your warp threads are getting really twisted from you turning the cards the same way all the time. 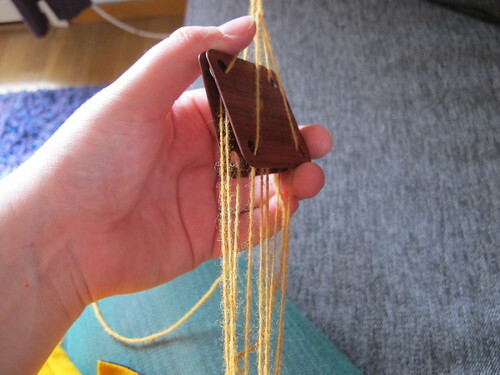 You need to change direction of the turning of the cards sometimes to get the twist out, this is best to do at either places where it will not be seen or where it looks nice anyway, since the changing of the direction will be visible. 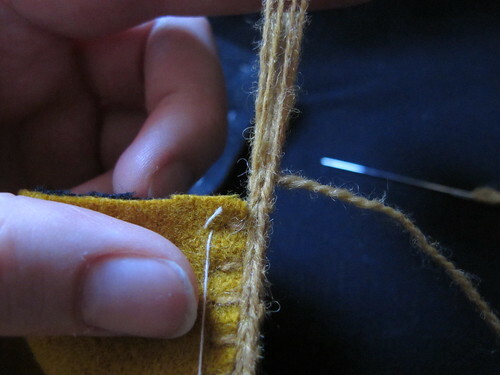 When I run out of thread, this is how I do. This is seen from the backside. 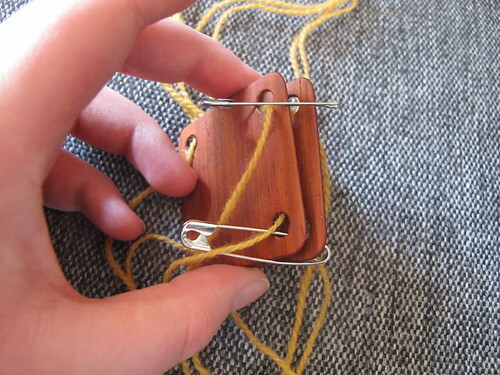 Leave the thread from the stitch hanging, turn your cards and just start with a new tread. We will fasten these later on. 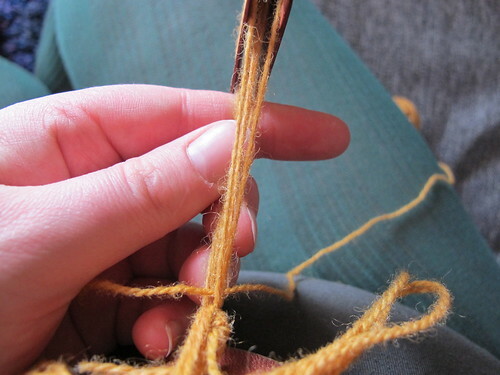 When I have woven all around and get to the last stitch I do as in the beginning. 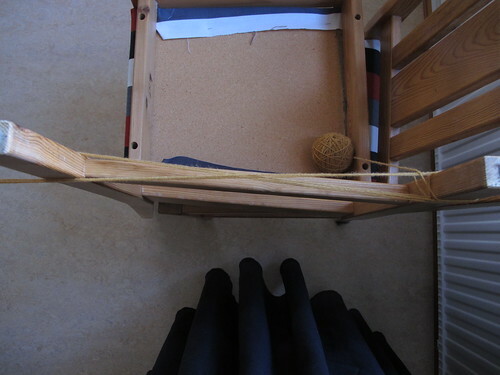 I just weave a bit of ordinary braid. 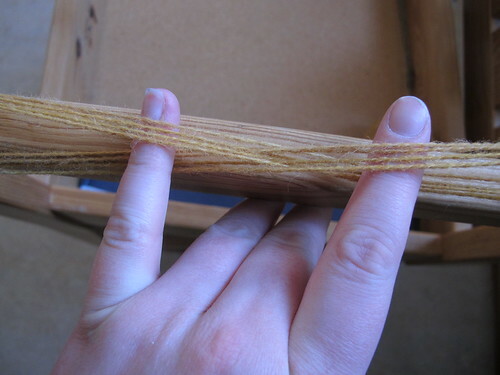 I got quite a bit left on the warp, I will save this in my stash, it might get some use if I need to edge something smaller sometime. Then I cut the cards of. 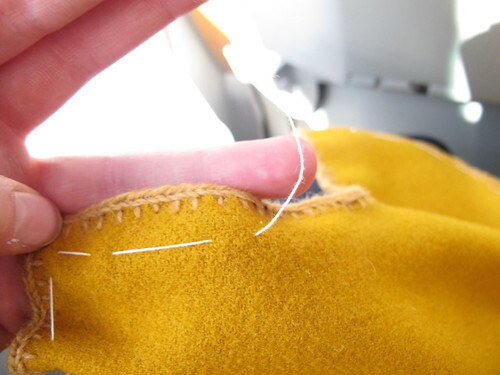 Now it is time to fasten loose threads. 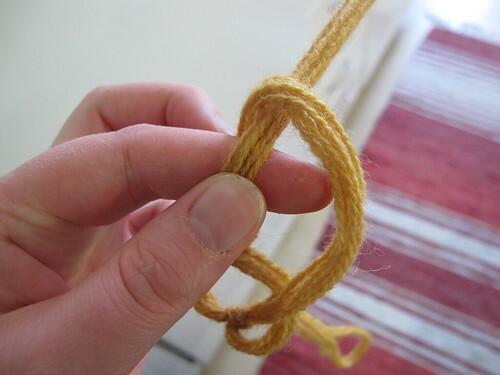 I tie a double knot as close to the braid as I can. 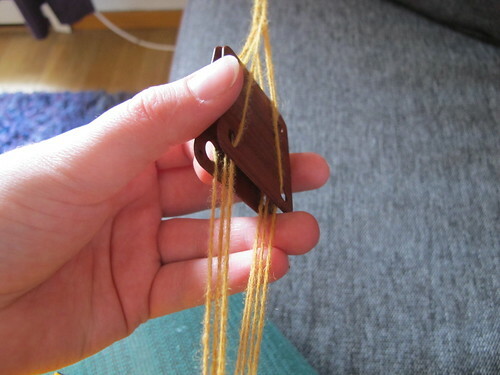 Then I use a needle to thread the end of the thread trough the braid. One end in each direction. 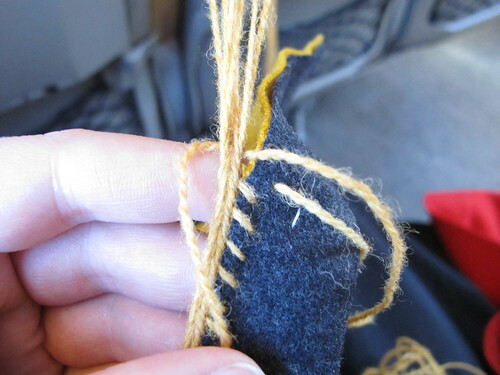 Cut the ends of and it is almost invisible! 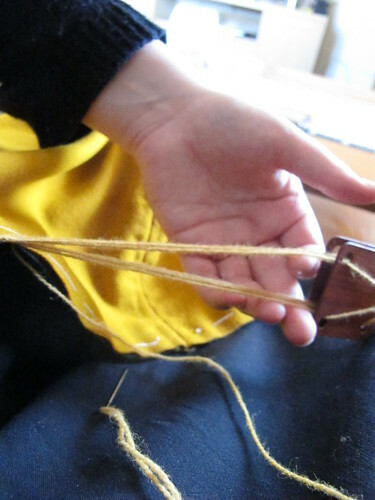 At the end of the weaving, I cut of the ends, fold them in and sew it all shut. Raw ends enclosed. 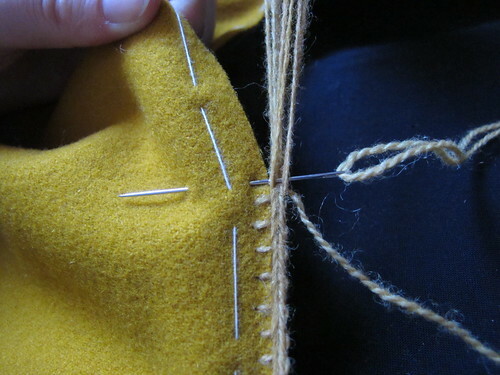 Then I take all the basting away and press the seams, the edges and the hood itself. And then you are done! 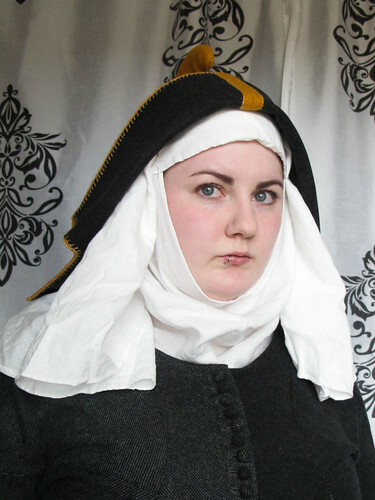 This is how it looks on, both with veil and wimple, and also with just my Birgitta cap. And as always, here is the pattern, it is made in cm as usual.